Add these clear lights to your BMW Z4 to enhance the look. 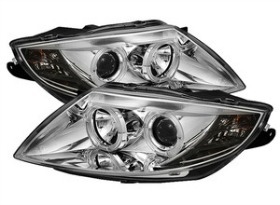 2003-2008 BMW Z4 CHROME Polyprophite Housing LED Halo Projector Headlights with Polycarbonate lenses will improve looks and visibility for your Z4 (Compatible with the Halogen Model ONLY). Made with OEM standard quality by ISO certified manufacturers for stock light direct replacement. CLICK on the title or picture to see how they look installed. 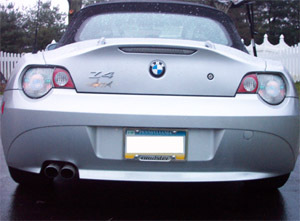 The BMW Z4, one of the most popular sport roadsters of all times, had one draw back - the original factory headlights did not come with a halo so they do not stand out as a BMW, hence the development of the Angel Eye projector headlights that are easily replaceable to update the appearance and not break the bank. We offer these projector angel eye headlights with LED Halos in either CHROME or BLACK housing for the customer to fulfill their own personal style. Sold in sets of two with the housing and all bulbs. Halos can be connected to the parking light wiring. There is even a european day-time-running light (normally not used on U.S. cars). Not compatible with the Xenon/HID model. Price $574.95 + S/H - PLEASE CALL FOR CURRENT PRICING! 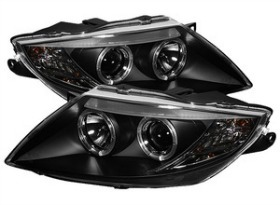 2003-2008 BMW Z4 BLACK Polyprophite Housing LED Halo Projector Headlights with Polycarbonate lenses will improve looks and visibility for your Z4 (Compatible with the Halogen Model ONLY). Made with OEM standard quality by ISO certified manufacturers for stock light direct replacement. CLICK on the title or picture to see how they look installed. 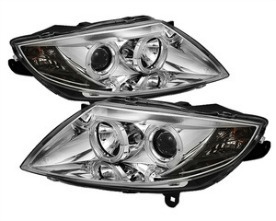 2003-2008 BMW Z4 CHROME Polyprophite Housing LED Halo Projector Headlights with Polycarbonate lenses will improve looks and visibility for your Z4 (Compatible with the Xenon/HID Model ONLY). Made with OEM standard quality by ISO certified manufacturers for stock light direct replacement. CLICK on the title or picture to see how they look installed. Sold in sets of two with the housing and all bulbs. Halos can be connected to the parking light wiring. There is even a european day-time-running light (normally not used on U.S. cars). Not compatible with the Halogen model. 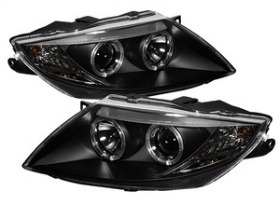 2003-2008 BMW Z4 BLACK Polyprophite Housing LED Halo Projector Headlights with Polycarbonate lenses will improve looks and visibility for your Z4 (Compatible with the Xenon/HID Model ONLY). Made with OEM standard quality by ISO certified manufacturers for stock light direct replacement. CLICK on the title or picture to see how they look installed. 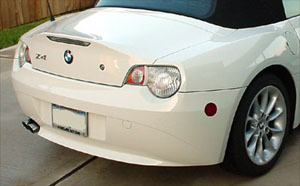 These Z4 clear side markers are just the finishing touch you've been looking for. Install in minutes with no tools required. Unlike everywhere else, this kit comes complete as shown with two new Roundel badges. Yellow bulb inside clear lense. Sold in SETS of two. 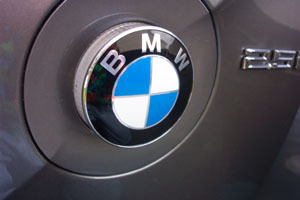 Here is a new replacement EOM BMW roundel for your Hood, Trunk, or Side gills. These emblems loose their finish which distracts from the beauty of your car. This is an easy way to make your Z3 or Z4 look better. We supply this emblem with new hard rubber grommets. If the complete light kit is too much, then add this center brake light to the side markers for a more economic approach. Clear lense has red lights behind. This is the official BMW part. Easy installation! Requires a 8mm deep socket. Fits the E85 Z4 2003-2008. CLICK on the Picture or Title for installation assistance. Want just the tail lights? Here you go. 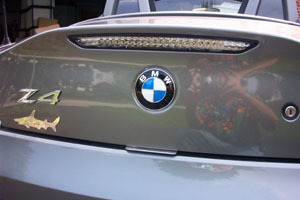 Change your Z4 to the clear lite look. Includes both tail lights. An 8mm deep socket required for installation. Two side markers left and right are available above. The center rear brake light is available above. These lights are intended for the 2003-2005 Z4. Complete kit for changing your Z4 to the clear look. Includes both tail lights, 2 side markers left and right, and the center rear brake lights. An 8mm deep socket required for installation.